Rubik's Cube, Bubbles And Green Army Men Join Toy Hall Of Fame : The Two-Way Four well-loved toys are inducted into the National Toy Hall of Fame, beating out fellow nominees such as the Operation skill game and Fisher-Price Little People. 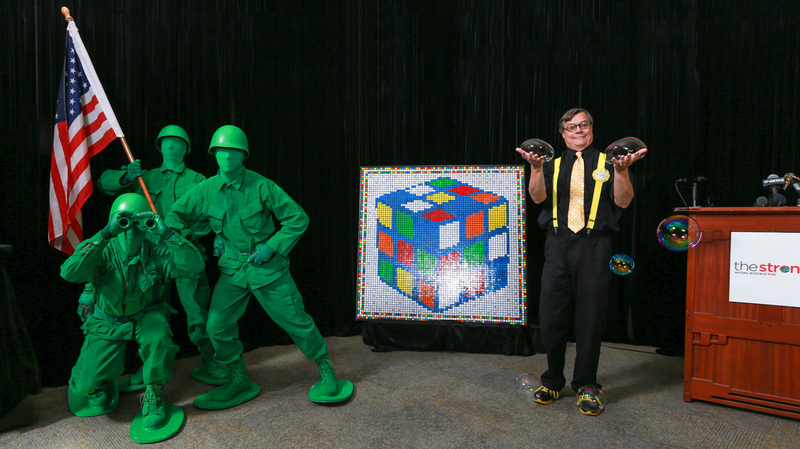 Three toys — green army men, the Rubik's Cube, and bubbles — were inducted to the Toy Hall of Fame Thursday, in a ceremony that included "Bubble Man" Doug Rougeux. They've littered kids' rooms for decades. And now four well-loved toys have been inducted into the National Toy Hall of Fame, beating out fellow nominees such as the Operation skill game and Fisher-Price Little People. "Magical, iridescent bubbles; monotone, miniature little green army men; and the colorful, puzzling Rubik's Cube became the latest inductees" to the Hall, according to the National Museum of Play, also known as The Strong. Those toys join a Hall of Fame roster that includes Mr. Potato Head, the Hula-Hoop, the Atari 2600 video game system and the Slinky. Ubiquity might have gotten the better of two of this year's nominees. How else to explain the failure of paper airplanes and pots and pans in their bids for enshrinement? Other nominees included American Girl dolls, Hess trucks, My Little Pony, the ever-sibilant Slip'N Slide, and the newly filmic Teenage Mutant Ninja Turtles. The Strong says that to earn a place in the Hall, a toy must have both iconic status and longevity. It should also bring a sense of discovery and innovation. If you feel that our favorite toy — sidewalk chalk, anyone? — has been left out, you can nominate it.